After my rather depressing post last time, I wanted to post something happy. Immediately my mind went to this song that I love in Raga Nalinakanti, a most cheerful sounding piece of music. As I pored over the translation, my mind wandered off in a tangent with the pallavi line itself. ‘O Mind, won’t you listen to my appeal?’ says Tyagaraja. This device of addressing one’s own mind occurs in music and literature often enough for us not to be surprised by it. But today I asked myself ‘Who is the addresser and who is the addressed?’. I was first reminded of the mindfulness exercises in some meditative techniques. One is supposed to watch the thoughts flow by without stopping them, just watching them stream past without reaction. A mind watching its own thoughts? ‘Who is the watcher?’ I wondered, ‘and who is the watched?’. I have tried this meditation technique myself and yes, it is quite possible to do this. And so another question arises – if the mind can split into the watcher and the watched, can it split into more parts? I became engrossed in reading many articles on mind and consciousness, within Hindu thought or otherwise. But I couldn’t get any specific answers to my questions. Coming back to our song, Tyagaraja says ‘O Mind, won’t you listen to the one who knows the compassionate heart of Sri Ramachandra? I am revealing all the secrets’. Oh! So part of his mind knows secrets that the other part doesn’t know? I do know unhealthy minds can keep secrets –such as in amnesia- but can a healthy mind keep secrets from itself? I don’t think so. But the subconscious can and does keep secrets from the conscious mind. Is this intended to be a song from the subconscious to the conscious? I know, some of you may well be thinking that I am making too much of this, that it is merely a literary device. That is probably very likely. Still, Tyagaraja was such an evolved soul; it behoves us to examine his words and make sure we look beyond the obvious and glean as much wisdom as we can from them. That said, this is such a lovely piece of music that one finds joy in the very flow of the notes. And sometimes that is more than enough. For the last two days I have been hearing innumerable renditions of this song. There are so many beautiful renditions that it was a difficult choice for me. 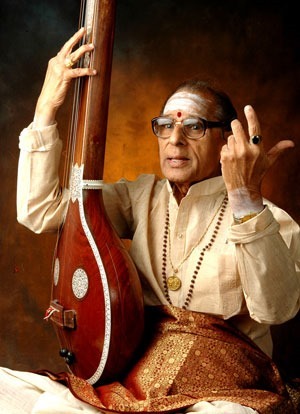 But when I heard this version by Nedunuri Krishnamurthy (1927-2014), I knew at once that this was IT! I missed honouring him when he passed away in December; I am happy to have the opportunity to feature this illustrious artist in my blog today. There is a wonderful shower of swaras following the song, I am literally dancing to them as I write this! My only complaint is the missing gamaka on the word ‘Tyagaraju’ which only TMK and SKR seem to include..I just adore that gamaka, always makes me melt to a puddle! Alternate Link : Click here and download item 5 – free membership of Sangeethamshare is needed. And if you want to listen to an outstanding violin rendition, listen to Kanyakumari supported beautifully by Embar Kannan. Alternate link : Click here and download item 9. Note – As I do not speak Telugu, the translation is heavily dependent on various web sources. Won’t (rAda) you (aTE) listen (Alakincha) to my appeal (manavini), O mind (manasA)? I am revealing (telpedanE) all (ella) the secrets (marmamu) . Won’t You listen (implied) to my (nA) appeal, I (implied) who know (telisina) the compassionate (karuNA) heart (antarangamu) of the great (ghanuDaina) Sri Ramanchandra (rAma chandruni)? Seeing (kani) those who, attracted (AkRshTulai) by the opinions (mata) of the ritualistic action (karma) section (kAnDa) of the Vedas (implied), suffer (gAsi jendaga) as wanderers (chArulai) in the forest (gahana) of worldly existence (bhava), the Lord having incarnated (avatAruDai) as a human being (mAnava) exemplified (kanipincinADE) the right conduct (naData). Therefore, O Mind, won’t you listen to the appeal (implied from pallavi) of this Tyagaraja (tyAgarAju)?